I have been searching everywhere for a good tutorial on how to make a tank top out of a t-shirt but none of them are what I have in mind. 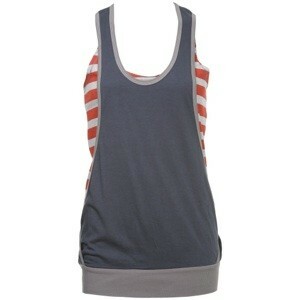 The tank top I want to make is open on the sides and has a wide stretchy band at the bottom. It's a racerback and has a regular scoop neck. Like the blue one in the picture. I would truly appreciate it if anyone could post a link to a good tutorial or if you have any tips or instructions to offer. Thanks! Have you looked in the men's departments? Sometimes their tank tops have the wider arm openings like you're looking for. Maybe you could someone sew a wide band as you want on the bottom for you to customize. No pattern needed: It's super easy to make these tank-tops without a pattern! (even for beginners)... All you need is a tank top that fits well (to use as a pattern) & a sewing machine that does a basic zig-zag stitch. I made a whole bunch of these for my boyfriend! All you need is a T-shirt or a doubled-over piece of fabric. The fabric should be a knit (either T-shirt knit or one-way or 2-way stretch). When you cut out the tank top make sure the fabric is placed so the stretch is horizontal. This is the rule of thumb for all knit fabrics (because if the fabric stretches the long way (vertically) the shirt will eventually stretch out of shape. You want the stretch to be across you body for a better fit. Buying Fabric: Measure your original tank-top to see how long it is & add several inches. That's how much fabric you'll need. Sometimes the stretch goes the other way & you'd need to measure the width of the tank instead of the length. If you are making this tank-top fairly baggy you can use a T-shirt knit fabric (a t-shirt knit is a knit that has hardly any or no stretch at all) But since my boyfriend is a body builder He likes his tank's a bit on the tight side, so I used a stretchy knit to make mine. * See directions below for making them from a T-shirt. Your original tank-top is the pattern. Lay the fabric out (right sides together) on a flat surface with the stretch going sideways (horizontal) to the shirt. Then turn your tank-top inside out & lay this on top of the doubled-over piece of fabric. If you have pins, pin the tank top to the fabric. If not smooth the 2 fabrics together with your hand to make them flat. Cut the fabric out by following the original tank-top's shape. Cut it out HALF an inch wider all around (this is a 1/2 inch seam allowance). Sewing: The fabric should be right-sides together. First sew the shoulder seams together (1/2 inch seam allowance) then either iron the seams open or cut the seam a bit smaller & zig-zag the edge to finish (either will work because knits don't usually ravel like woven fabrics do). Next sew the side seams & finish the same way as the shoulder seams. * Zig-Zag: If you're machine is a computer machine you'll want the zig-zag set to 3.5 x 3.5 or 4.0 x 4.0. If it's a mechanical machine the zig-zag setting should be around 4 for the width & the length of the stitch should be the same as the width (each machine is different). Basically, you don't want the stitches to be super wide or super long or super tiny either! Do the bottom hem in the same way. (Fold up & zig-zag on & off the folded fabric). But if you want, you can make the hem wider (like 1 inch instead of 1/2an inch wide). Now you are done! & all you had to do was sew together 4 seams (2 at the shoulders & one on each side) then fold & zig-zag-hem the neck, arm holes & bottom hem! * If you're using a T-shirt Instead of fabric. Turn both the tank-top & the T-shirt inside-out then match up the shoulder seams on the tank-top with the shoulder seams of the T-shirt & pin or smooth them together flat with your hands. Now cut the neck area out of the T-shirt & the arm holes to match the tank-top. (leave an extra 1/2 inch for seam alowance) Hem these following the directions for zig-zagging above (zig-zag on & off the hemmed fabric so it won't fray or roll)... If theT-shirt is a lot wider than the tank-top, you'll also have to cut the sides off to half an inch wider than the tank-top you're using for a pattern. ---> The only thing you may not be thrilled about is the way you can see the zig-zagging on the front side of the fabric. But, I've found that most people don't even notice the zig-zagging as long as your thread matches your fabric exactly. If you have a fancy machine or a serger then you can make these tanks without zig-zaging the hems. But then you wouldn't be a beginner then would you!? * Another Option: If you're a little more of advanced, you can put ribbing at the armholes & neckline instead of turning the fabric over & zig-zagging the hem. Cut the ribbing or stretchy fabric (it can be the same fabric as the shirt if it stretches) to double the width you need it plus an inch for seam allowance. Or, if it's folded & ironed just add half an inch to the width (seam allowance). Fold the ribbing in half & iron it flat. You'll need to make 2 different widths of ribbing. One narrower for the arm holes & neck & the wider ribbing for the bottom area. * To sew ribbing on: Simply put the main shirt on the bottom with the right side facing up & the folded ribbing on the top. Set your stitch to straight-stitch a sew them together with a half inch seam allowance. As you sew, pull SLIGHTLY on the ribbing. Pull the ribbing just a tiny bit. It's best to first pin the ribbing to the shirt at quarter sections to make sure the ribbing has the same stretch all around. Now sew the beginning & ending pieces of ribbing (or the whole seam including the ribbing together). Lastly, iron the seams flat to finish. Sometimes I'll top-stitch. If you're not really sure how to make this. Start with a Teddy-bear tank top or sew one for a child. This way you can get your skills down before you tackle a large tank-top for yourself! This is what I sometimes do. About.com has DIY on how to make projects out of T-Shirts. There's all kinds of projects to make from them. Check it out.